Forget about what's happening on the college playing field. The real action is often on the sidelines or in the stands as team mascots, often costumed as fierce animals, drive fans to a screaming frenzy against the opposition and lead them in shouting their favorite team to victory. They're everywhere. And they are animals! Well, many of them are, anyway. All during the contest, no matter what the game, the crowd is fired up by the likes of bulldogs, panthers, eagles, tigers, squirrels and anteaters. Huh? Squirrels and anteaters? It's true, sports fans. Some college mascots simply are truly weird ... and every one of them has an interesting story to tell. In no particular order, here are 10 of those most interesting college mascot stories. 1. Gladys, the Fighting Squirrel. 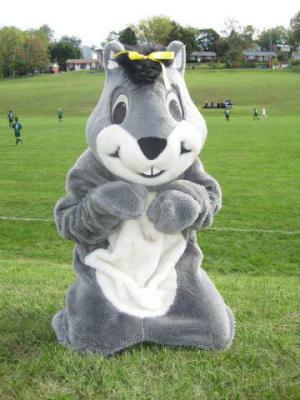 Glady the Fighting Squirrel is the mascot at Mary Baldwin College in Staunton VA and she should not be taken lightly. She romps across playing fields that once were part of Staunton Military Academy, a pretty good prep school in its day and one that prepared countless numbers of young men to be leaders in our nation's military. The squirrel, as it turns out, was the central figure in the family crest of founder Mary Julia Baldwin and, according to the college's website, " ... the squirrel is a symbol of industriousness, trustworthiness, and preparation for the future ,,, qualities that apply to Baldwin athletes who know that diligent work will pay off at game time and that their teammates depend on them ..." Why the name Gladys? No one seems to know. 2. Gaylord, the Fighting Camel. 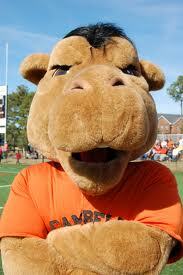 By the way, no other Division I school and only one other college or university has a camel for a mascot. 3. Donald Duck, the Duck. Yes, that Donald Duck is the mascot at the University of Oregon, Eugene, one of the top ranked Division I schools in the nation, both academically and athletically. Oregon was originally known as the Webfoot State, a reference to a band of Massachusetts fishermen who helped save General George Washington and 10,000 of his troops from the British in 1776. When Webfoot descendents migrated west of the Cascades in 1840, the Webfoot name came with them. 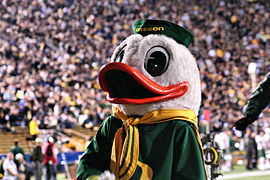 Sports writers through the years more and more reported the name as the Ducks and the Oregon mascot was born. In 1947, Leo Harris, the university's first athletic director, struck a handshake deal with Walt Disney himself, allowing the school to use Donald Duck's likeness as the mascot, " ... as long as it was always done in good taste." Decades later, lawyers being lawyers, there was some discussion about whether the university had the right to use Donald as the mascot, that is, until Harris produced a photo of Walt Disney wearing an Oregon letterman's jacket with the Oregon Duck clearly visible on the front. That was enough to convince all parties to produce the school's first written contract, in 1973, to continue to use Donald as the mascot. 4. Sammy, the Banana Slug. 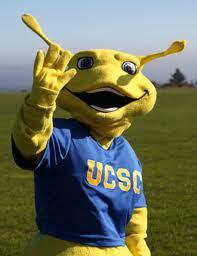 There's hardly a website of weird mascots that doesn't include the University of California - Santa Cruz mascot, Sammy the Banana Slug. The story here is that " ... the laid back student body disapproved of the fanatical athletic programs at other schools, so they chose a distinctively casual mascot." Hey, how more casual can you get than a slug? And keep in mind that this is California that we're talking about, where stranger things have happened. Banana slugs are mollusks (which includes clams snails and even squid and octopi) and are found in the redwood forests near the university. In 1992, Sammy was named the top mascot by both the National Directory of College Athletes and Sports Illustrated magazine. Readers's Digest presented Sammy with similar honors in 2004. What else would you expect Evergreen State College to chose for a mascot but a geoduck (pronounced gooey-duck)? Everything about this liberal arts college is different, from its Latin motto Omnia Extares ("Let it all hang out") to its one-acre organic garden, which produces crops sold in the local community and to the campus food service department (and, in the process, teaches students about crop rotation and sustainable agriculture). Described as an experimental and non-traditional type of college, Evergreen also has about 3,300 feet of untouched beach on Puget Sound. Students use the beach for scientific study and to relax away from the rigors of academia. Which brings us back to the mascot; there's nothing ducky about Speedy. It's actually a saltwater clam (yep, another mollusk), one of the world's largest clams and a native of the Pacific Northwest, found right around Evergreen State College. Which is probably why the school, located in Olympia WA, selected it as a mascot. 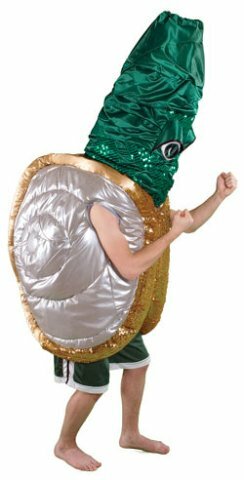 As mascot names go, however, Speedy might be a bit of a stretch for a clam. "Zot!" is the imagined sound an anteater makes when attacking its prey and it's also the sports battle cry at the University of California - Irvine, where students shop at campus convenience stores named "Zot 'n Go" and the school administration sends campus-wide e-mail called "Zotmail." 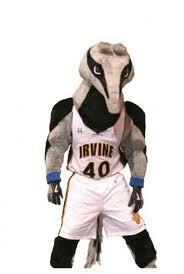 Its all done in recognition of Peter the Anteater, Cal-Irvine's mascot since 1965. That's when students selected the anteater as the official mascot in an election that recorded "None of these" as second choice and the usual and less imaginative eagles, seahawks and unicorns as also rans. School administrators were not too crazy about having an anteater as mascot either, but Peter caught on and has prevailed all these years. Peter has his own web page on the school's website and describes himself as a student majoring in spirit, entertainment, loyalty and tradition, while minoring in myrecology -- the scientific study of ants. He has a fanatical following among students through campus clubs such as the CIA (Completely Insane Anteaters), CIA Band, and the Modern CIA Dance Team. 7. YoUDee, the Fightin' Blue Hen. Hen chickens aren't normally thought of as fighters (as opposed to roosters, which love to tear into each other and will often fight to the death). YoUDee, the University of Delaware's mascot, is a hen in name only and its origin can be traced all the way back to the American Revolution. In 1775, Capt. John Caldwell, an owner of gamecocks, was placed in charge of part of a Delaware military regiment. Assembled as a company, the troops often amused themselves by staging cockfights, with a particular fondness for a breed known as the Kent County Blue Hen, a bird with blue plumage. In cockfighting circles, word quickly spread of the Blue Hen rooster's ferocity and fighting success. So did the fighting reputation of Capt. Caldwell's company, in fierce battles with the British at Long Island, White Plains, Trenton, and Princeton. The unit was named "Caldwell's Gamecocks." The full regiment took on the Blue Hen persona later in the war, also using the nickname "Blue Hens' Chickens." The Blue Hen was named the official state bird in 1939. YoUDee was an obvious choice for the mascot's name. 8. Ephelia, the Purple Cow. 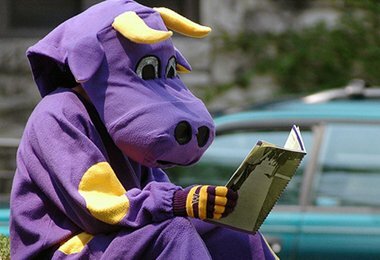 Before you scoff at the image of a purple cow as a college mascot, you need to know that Winston Churchill's mom had a hand in creating this one. Eugene Jerome (Williams, Class of 1867), writing in a Williams alumni bulletin, describes how his sister and his cousin were both distraught that the Williams College baseball team, in 1865, was about to depart for the final game of the series against Harvard without an official team color (Harvard had already chosen magenta, which would eventually evolve into crimson). The two young women rushed out and purchased royal purple ribbon, quickly made small rosettes out of it and pinned them on each member of the departing team. Williams won the game as well as the intercollegiate championship over Harvard and Princeton. And purple has been the Williams color ever since. Oh yeah, Eugene Jerome's cousin? She was Jennie Jerome and she later became Lady Randolph Spencer Churchill, the mother of Sir Winston. As for the cow, that's still a bit of a mystery. One theory has it that when dairy cows grazed at sunset in a valley not far from the college, they took on a purplish tinge from the nearby Berkshire Mountains. The name Ephelia was selected in a contest sponsored by a local radio station in 1952. 9. SuperFrog, the Horned Frog. The Texas Christian University mascot has been around since 1896, longer than the TCU name, in fact. And he's not really a frog. He's a lizard. The original school was named AddRan University and the place was crawling, literally, with the spine-covered little reptiles. One story has it that someone remarked that the school's football players looked like horned frogs as they hopped and scampered around the field doing their drills. Another story says a committee selected the horny little critter as the official mascot in 1867. Probably some parts of both tales are true. The TCU mascot has gone through a number of costume changes through the years. When a new costume was introduced to the media in 1979, a TCU marketing person remarked, "We don't have a name for the mascot, yet, just call it Super Frog for now." The name stuck. in 1906. The horned frog was named the State Reptile of Texas in 1992. Washington College has the distinction of being the new nation's first college, founded in 1782 under the patronage of George Washington, who donated a gift of 50 guineas. General Washington served on the college's Board of Visitors and Governors for five years before accepting the presidency of the United States. 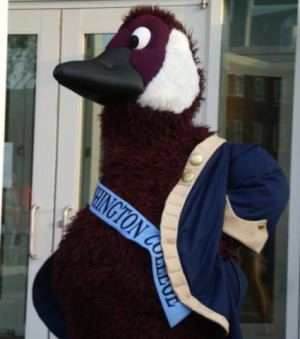 The Eastern Shore school, located in Chesterton MD, only about 75 miles from the nation's capital, also has the distinction of being home to one of the nation's newest college mascots, Gus (formally Augustus) the Goose. Throughout its history, a likeness of George Washington, as well as the names Shoremen and Shorewomen have served school spirit. The latter two names are still nicknames of athletic teams at WC. But at a school picnic in September 2011, the official start of the academic year, Gus was introduced to student and faculty as the official mascot. "This goose is a direct descendent to a goose that befriended George Washington many years ago," said Mitchel Reiss, president of the college. Looks as if the name Gus was chosen by vote, with Willard trailing in close second place several weeks before the start of the fall 2011 semester. There are other strange mascots driving fans to a frenzy around the nation's colleges and universities; even more at our high schools. The Boll Weevil reigns supreme at the University of Arkansas - Monticello, Bucky the Parrot is at Florida's Barry University, Tulane has Riptide the Pelican, at Southern Illinois its a Saluki (a breed of dog), and the list goes on and on. So, what are the most-oft used animal mascots at our four-year colleges and universities? According to USA Today, 74 institutions of higher education have the Eagle leading their cheers. Others include Tigers (46), Bulldogs (39), Panthers (33), Lions (32), Bears (30), Hawks (28), Cougars (27), and Wildcats (25). Want to know just about everything there is to know about college mascots? Get a copy of Mascots! The History of Four- and Two-Year College and University Mascots and Nicknames, by Roy Yarbrough, PhD. It's an interesting read. So which of these college sports mascot do you think has the most interesting story? Is your college mascot a bit unusual?